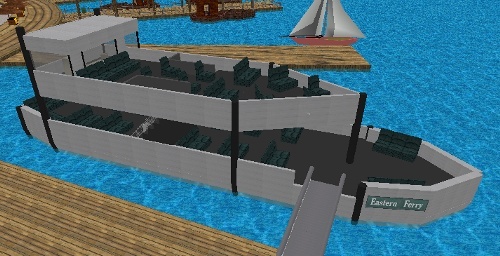 Eastern Ferry is a ferry service in SW City. In November of 2004, the SW City Administration decided it was time to give the citizens of SW City a new way to travel to other major islands in the Irenic Ocean. At the time, only Palm Sea Ferry was the only service running and it wasn't going to islands such as Velothi Island or Sybit Island. The only other way to travel to other islands was the streets (via Hovercrafts)) or airplanes from the SW City International Airport. New, state-of-the-art ferry's were constructed at Port Cobalt that could quickly transport a maximum of approximately 90 people to six different stations around the city. The Department of Transportation decided that numerous ports would be opened up for Eastern Ferry service. Access to and from these stations has been described as "quick and efficient". The service runs seven days a week, 365 days a year. Like the SW City Subway system, the Ferry service runs free for anyone who would like to use it.